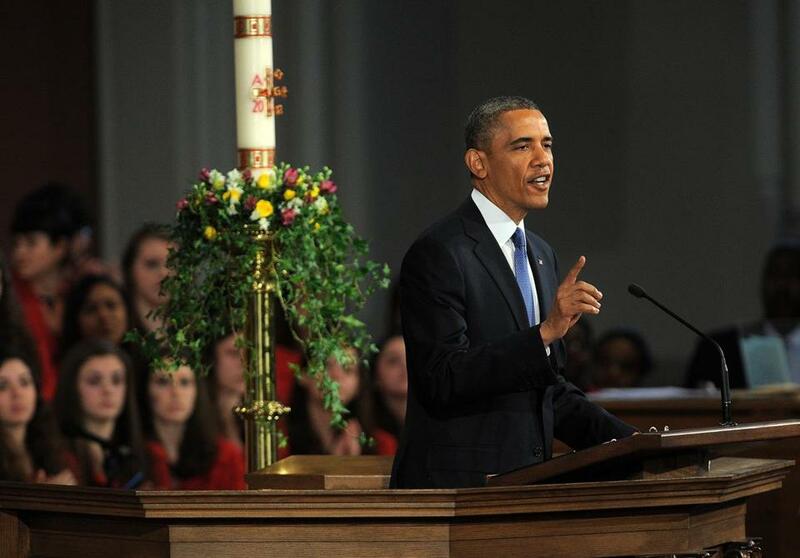 US President Barack Obama spoke at the interfaith service. President Obama said today that America stands with the city of Boston after the deadly terror bombing attacks at the Boston Marathon finish line on Monday. “I’m here today on behalf of the American people with a simple message: Every one of us has been touched by this attack on your beloved city. Every one of us stands with you,” he said. Three people died and more than 170 were injured when two blasts were detonated near the finish line at about 2:50 p.m. Monday. A massive investigation is underway, but no arrests have been made yet. A confirmed list of victims of the explosion on Monday. Obama, who traveled to the city on Air Force One this morning with his wife, Michelle, and members of the state’s congressional delegation, promised that whoever planted the bombs would be brought to justice. And he promised toward the end of the speech that the Boston Marathon would go on, as would the celebrations that have been held on the same streets for the city’s championship teams. “When the Sox, the Celtics, the Patriots, the Bruins are champions again – to the chagrin of New York and Chicago fans – the crowds will gather and watch a parade go down Boylston Street. And this time next year, on the third Monday in April, the world will return to this great American city to run harder than ever and to cheer even louder for the one hundred and eighteenth Boston marathon. Bet on it!’’ he thundered. Former governor Mitt Romney, who lost the election to Obama, was one of those attending the service. Obama has spoken in the past to try to comfort communities in shock and mourning. He spoke after the mass murders at Fort Hood in 2009, Tucson in 2011, and Aurora, Colo., and Newtown, Conn., in 2012. President Obama after the ceremony went to Massachusetts General Hospital. A White House spokesman said both he and Michelle Obama planned to meet with victims of the blast and their families and first responders. Obama, who spoke for about 20 minutes to a packed crowd of about 2,000, was one of a series of speakers at the service, which lasted for an hour and a half. The other speakers included Cardinal Sean P. O’Malley, clergy, and Governor Deval Patrick and Mayor Thomas M. Menino. The crowd also included former Massachusetts governors, including Mitt Romney, who challenged Obama in last year’s presidential election. A symbol of determination himself, Menino stood up from a wheelchair, grimacing at his broken leg, to talk about the strength of his beloved city. “I have never loved its people more than I do today,” Menino said this morning. “We are one Boston. Nothing can tear down the resilience of this city.” After a series of illnesses last fall, Menino, the city’s longest-serving mayor, announced he would not seek reelection. He recently suffered a broken leg. Patrick said the “cowardice unleashed on us” should not cause people to lose their faith in America’s civic ideals. Mervyn Williams, 34, an X-ray technologist from Boston Medical Center who was on shift when bombing victims began streaming in Monday, sat in the second row with Yo-Yo Ma, wearing blue hospital scrubs. Wesley Lowery, Lisa Wangsness, and Martine Powers of the Globe staff contributed to this report. Andrew Ryan can be reached at acryan@globe.com Follow him on Twitter @globeandrewryan.